We’re heading into the final two rounds of the Pro Mazda Championship this weekend in Sonoma, CA. So far it’s been a great season. We have had our share of disappointing races but we’ve had more ups than downs and I’m leading the championship by 18 points. I’ve been traveling a lot, racing the past three weekends in a row, two in Pro Mazda and one in the Porsche GT3 Cup Canada. A few weeks ago we were at Mid-Ohio which ended up being one of those disappointing weekends. It started out really well, I was fastest in the two practice sessions and led most of qualifying. Mid-Ohio is a tough place to pass so qualifying was extremely important. Everyone knew that so almost every team selected to run two new sets of tires in qualifying, instead of saving one for a race like we usually do. On the first set I was fastest but towards the end we all put on the second set. Unfortunately, on my first few laps I caught traffic and then a red flag came out that ended the session early. It was so close I slipped back to 8th. In race one I gained a few places at the start and a few more during the race to finish 4th. I was running 4th again in race two until I made a mistake and went wide in turn one. I went off the track and rejoined in 7th. I was only able to make up one position to finish 6th. It was a shame not to even be on the podium after the pace we had in practice and the first half of qualifying. Overall it wasn’t a horrible result, I only lost a few points in the championship that weekend. From Ohio I went back to Canada for the Porsche GT3 race with Alegra Motorsports at Trois-Rivieres. We were coming off a win in the last race at Toronto so we were feeling good about our chances on the street course. We missed the set up a little in qualifying and only managed 4th on the grid. After the first few laps I made my way up to second. The car was much better and I was all over the leader, Scott Hargrove, who happens to be my main title rival in Pro Mazda. I went to pass him but we made some contact and he spun. I ended up with a drive through penalty which ruined the race. He still recovered to finish second. I set fastest lap of the race and came back to finish 4th. Race two went much better, I started third and passed the two in front of me to win the race. We made some great changes during the weekend and it showed in race two, the gap at the end was about 10 seconds to P2. 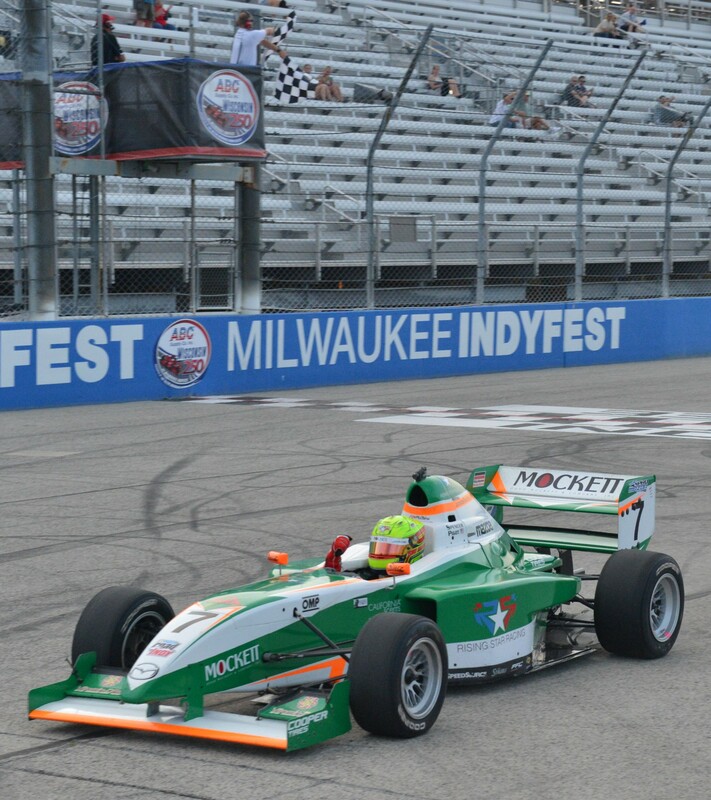 The Milwaukee Mile was my next stop, the penultimate weekend of the Pro Mazda Championship with Juncos Racing. I really wanted to do well here to gain as many points as I could heading into Sonoma. I was fastest in all four practice sessions but qualifying didn’t go as planned. The balance was just a little off. It’s such a competitive series that if you miss the setup just a little bit it will cost you. I qualified 4th, we knew it was going to be a long race (90 laps) and there would be plenty of time to make up positions. My engineer, Ernie, made a few small changes and they worked really well. I was up to second after the first few laps. Scott Hargrove and I pulled away from everyone else but I couldn’t find a way past for the first half of the race. Finally I had an opportunity on a restart and went down the inside in turns one and two. I made it stick and led the rest of the way. It was a vital pass because there was a big swing in the points. Two more races are left in both championships. First up is Sonoma this weekend and then I go straight to Mosport for the finale of the Porsche championship. That will be five weekends of racing in a row. It’s been busy but I wouldn’t want it any other way! Special thanks to all of my supporters: Mockett, Rising Star Racing, The Stutz, Vitamin D-Pro, California Scents, OMP, RaceLite Protection and of course my teams Juncos Racing and Alegra Motorsports.